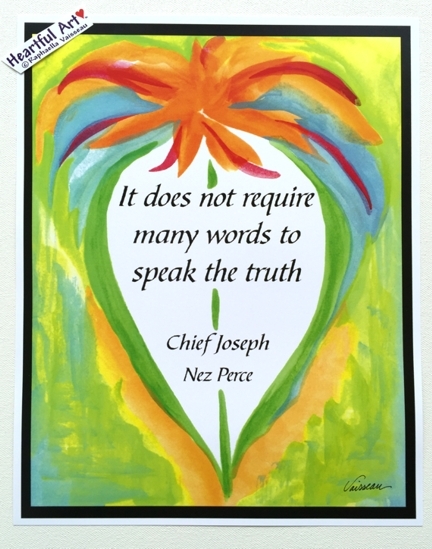 11x14 poster of a quote by Chief Joseph of the Nez Perce Nation, "It does not require many words to speak the truth" with art by Raphaella Vaisseau. This quote speaks to the integrity of honest, direct, truthful communication and the honor involved with keeping one's word. Truth is truth. Even though there are many points of view, we can all feel within ourselves when we step out of alignment with truth. Be direct. Walk your talk. Speak your truth. Be authentic. Share what's real and true for you. Honor what is true for others.